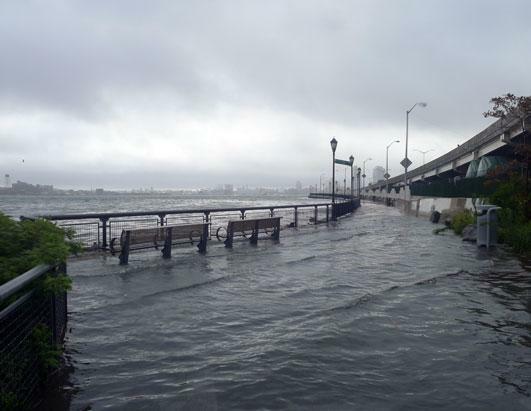 Extreme high waters occurred along East River during the landfall of (formerly) Hurricane Irene, about a 1-in-10 or 1-in-20 year sea level event. Similar high water levels are expected to occur much more frequently in future decades due to sea level rise. Water levels during this week's king high tide should be about 3 feet lower, as no storm surge is predicted to occur. Some of the highest tides of the year are coming in the next two days, and an event is being organized to raise awareness of sea level rise. Kate Boicourt at the New York / New Jersey Harbor Estuary Program Office is requesting that people email her at boicourt.kate@epamail.epa.gov to sign up and photograph the high tide water level at one of several locations around the region. For NYC, the tidal height (without any wind-driven surge effects) will be about a foot higher than normal high tide levels, simulating what global warming induced sea level rise may bring about in about 20 years. Or, put another way, the high tide will raise the water to 3.6 feet above local mean sea level, simulating what the mean sea level may look like later this century — while there is a lot of uncertainty, sea level is expected to rise around NYC by 1 to 4.5 feet by the 2080s. As a result of the sun and moon “pulling” the oceans in unison (spring tide), and the moon’s pull* being unusually large due to its point on its orbit (perigee), the next two days will have large tidal ranges in the region’s waterways as the water levels undulate every 12.4 hours between unusual highs and lows. Not only will the high tides reach higher than normal, but beachcombers may find it to be a very good time to visit beaches and mudflats to forage during unusually low water levels at low tide. A useful place to select a site to photograph and get the times of high and low tides is from the tide prediction database at http://www.saltwatertides.com/ . That site has many locations, but doesn’t include as much flexibility as I’d like, so for more details (but less locations), you can also look at the Storm Surge Warning System. There, select a station and then set both the start and end dates to only the day of interest. 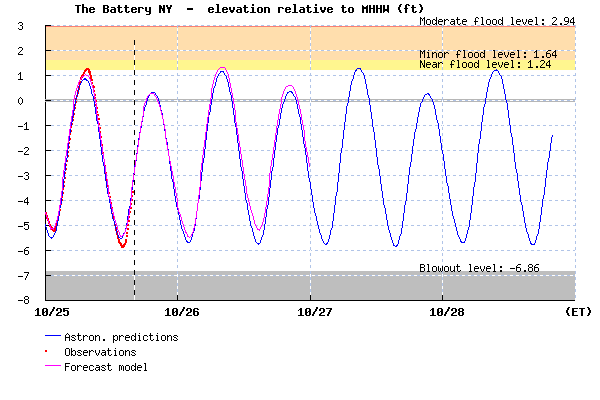 Tides, water level forecast and observations for Battery Park through Friday, relative to mean higher-high water (MHHW), the average daily high tide level. Look at the “astronomical prediction”, which is simply the forecast tide. The “forecast model” also shows you what to expect of the water elevation, combining the tides with the wind-driven surge (or blow-out). So far the offshore forecast today is for northwest winds, and the water levels are heading lower than tidal predictions. The forecast for tomorrow is for moderately strong southwest winds, which may continue this trend, but the departures from the high tide level predictions probably won’t be more than several inches. One other request made by Kate is for accompanying photos of normal daily high tide levels, which are also available on SSWS if you choose the option “Datum” of mean higher-high water (MHHW). Look at the time where you can expect MHHW to be crossed, and try to get a photo at that time for contrast (roughly 2 hours before or after high tide). * Note – the gravitation of the moon doesn’t simply pull on the ocean to create a tide — it is strong enough that the Earth and moon rotate as a pair around a central point, and as a result there is a bulge of the ocean on both the same side as the moon AND the opposite side. This entry was posted in climate, water and tagged beach, beachcombing, blowout, datum, king, New York City, perigee, sea level rise, spring tide, tide. Bookmark the permalink. I’ve just published a post “Morning Report from Cheviot’ about an extremely low tide on the Hudson River in Germantown, NY this past Sunday. I hope someone will take a look and get back to me with some sort of explanation for this tide. I really enjoyed poking around in your blog. I’m a ex-librarian who is generally anti-internet research, but your posts may be the beginning of my rethinking that bias. Thank you in advance!